The ACVIM Forum is one of the largest specialty conferences in the veterinary industry. Hosted by the American College of Veterinary Internal Medicine (ACVIM), this year’s conference was held last week at the Colorado Convention Center in Denver, Colorado. More than 3,000 veterinary professionals from all over the world were in attendance, coming from a wide range of backgrounds that included board-certified specialists, veterinary technicians, hospital administrators, and primary care veterinarians. I had a great time representing PetCure Oncology at our booth. This is truly an exciting time in veterinary medicine. 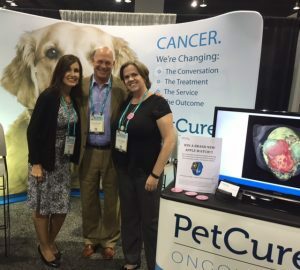 It was fantastic to interact with so many talented veterinarians to share our vision and raise awareness for the progressive treatments and best practices that are changing the face of cancer care for pets. There was a broad spectrum of vendors at the ACVIM Forum introducing new products and services. As usual, PetCure Oncology was right in the thick of it. Throughout the conference, we were able to introduce many in the industry to our brand of advanced radiation therapy – highlighting the significant benefits of stereotactic radiosurgery (SRS). Visitors to our booth were amazed at the visuals from SRS-treated cases that we shared to illustrate how treatment over time has changed, evolving into more humanized care for cancer treatment. And we couldn’t be happier with the reception we continue to receive from the veterinary community. We were encouraged by the optimism we saw in the faces of those learning about SRS for the first time. We were inspired by the excitement they exhibited as they left the booth, often returning with friends and colleagues to help spread the word. Perhaps most of all, we were humbled by the raw emotion – and occasional tears – from people who devote their lives to helping animals, yet still connect so deeply with their own personal pets that have been afflicted with cancer. After just one year in the market, the buzz about what we’re doing is taking off like wildfire. And the word continues to spread about how PetCure Oncology is changing the conversation when it comes to cancer care for pets. It is truly amazing to see the level of interest in SRS, and the way the veterinary industry is working together to strengthen the future of cancer care for pets. The enthusiasm is coming from all over the country, and I can’t wait to see where it goes from here! This personal blog entry was contributed by Jill MacKenzie, PetCure Oncology’s Program Director in the Phoenix region and the proud pet parent of Bella, a 10-year-old Golden Doodle and cancer survivor.